Married for centuries and now living half a world apart for reason or reasons unknown, two vampires wake as the sun goes down. Adam (Tom Hiddleston) sits holding a lute in his cluttered Detroit Victorian, as Eve (Tilda Swinton) wakes up in her sumptuous bedroom in Tangier, surrounded by tons of books. These are completely modern vampires. They don’t go and attack people because there is the “good stuff” available in hospitals – safe, clean, cruelty-free. Their biggest fear is contamination from blood, poisoned by the degradation of the modern environment. On a hunch Eve calls Adam and her husband seems to be seriously under the weather. Concerned, she decides to pay him a visit. The same idea occurs to her younger (?) sister Ava (Mia Wasikowska). Three vampires in a flat? There will be troubles. And blood. I grant it, it was a highly atmospheric movie. That atmosphere made it float up to a point admiringly well. A reclusive rock musician. His pale muse/lover/wife who resides across the globe in Tangier, but stays in touch with her Apple iPhone (Adam, Eve, Apple. Perfect). The ennui. More ennui. Mushrooms. Blood in short supply. A double-trouble bratty younger sister who has to spoil everything whenever she turns up. I liked it all, I really did, but then, roughly after an hour, I missed some action. If only Ava/Mia brought a lover or two in tow. If only there were more vampires fighting for ‘lebensraum’ and an easy access to blood in the neighbourhood (but then it wouldn’t be a Jarmusch movie, I know, I know…). I finished this movie being a little bored, not sure what the director wanted us to see and/or understand. An universal love story? A modern soul drama? Both? Wikipedia dutifully informed me that in 2016, the film was ranked among the 100 greatest films since 2000 in an international critics poll by 177 critics around the world. Well, it wouldn’t get my vote for sure. If you are a fan of Hiddleston and/or Swinton you are going to watch this one sooner or later just for the couple’s wry sense of humour. Perhaps it is worth borrowing to fill in a long, autumn night, after all as a perfect example of cinematic dandyism. Still does dandyism have to be boring? 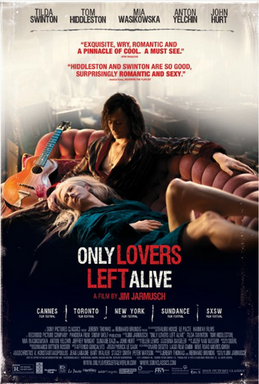 This entry was posted in contemporary, dracula/vampire movie, movie review and tagged jim jarmusch, modern vampires, movie review, only lovers left alive, Tilda Swindon, tom hiddleston. Bookmark the permalink. Interesting cast! I am curious. I wonder if I can find it. Well. Maybe you’ll like it better than me.